Free-Living Ringnecks - A Success Story? Man has introduced many creatures either by accident or design to habitats that are foreign to the animals’ original homes. Familiar examples include rabbits, cats, brown rats and grey squirrels. In the majority of such cases such introductions cause harm to the new environment or its existing occupants. Rabbits destroy vegetation; brown rats and grey squirrels in the UK have seriously reduced populations of native black rats and red squirrels, as well as carrying alien diseases; while escaped domestic cats have interbred with native wildcats, and damaged populations of wild birds. Exotic birds like Mandarin ducks, ornamental pheasants, or Egyptian geese have escaped from, or been deliberately released, from private collections, and now survive and breed successfully in the UK. These waterfowl species so far have not had seriously damaging effects on either our environment or its native species. Pre-existing native species that have become rare or even extinct in their native habitat have been re-established successfully in some areas. These include the Chough, Red Kite and White-tailed Sea Eagle in Britain. Domestic animals like the cat, which have escaped and live wild are known as feral, while foreign species that have settled and formed sustained breeding populations are naturalised. 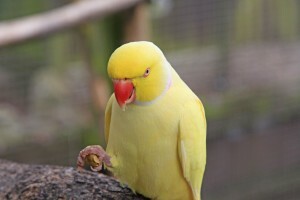 Britain has no naturally occurring native species of parrot, although some keepers will free-fly their birds, while others escape from their homes. Smaller species like budgerigars, or colourful parakeets rarely survive long, succumbing to starvation or predation, but larger parrots can survive for several weeks in good weather. In western Europe, however, two psittacine species have managed to survive very well and establish free-living breeding colonies to several generations. The first of these is the Quaker (or Monk) Parakeet (Myiopsitta monachus) building their large, untidy, colony nests of sticks on trees and telegraph poles in suburban areas of Spain and France. 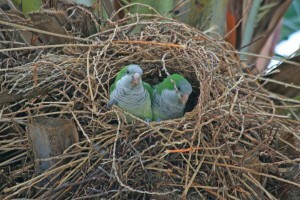 The second example – and far more common in the UK – is the Ring-necked Parakeet (Psittacula krameri), which is proving very successful at colonising new areas. The late John Hayward of the National Theft Register reported that he frequently had calls from members of the public claiming that “there was an escaped green parrot in their garden”. John would ask “Does it have a long tail and a red beak?” The affirmative reply would instantly identify the bird as one of the many naturalised Parakeets that live wild in this country. They are now recognised as such and included in most modern bird guides. See also What's in a Name? Ring-necked Parakeets are now widespread in the UK, especially in London and the Home Counties, but with smaller populations appearing in central and west Midlands, east Anglia, Lincolnshire and Lancashire and progressively further north. 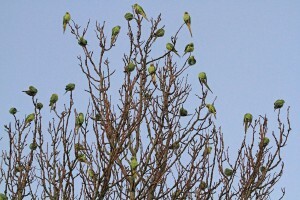 A 2015 survey reported over 85,000 parakeets from 10 European countries, with the greatest number (31,000) in the UK So where did they come from? There are many apocryphal tales such as the deliberate release of several Parakeets after the filming of The African Queen at Isleworth in 1951, or by Phil Lynott, singer and guitarist of the group Thin Lizzy in the 1970s. There is little doubt that there have been some releases that were deliberate, but the majority appeared as escapees from aviary collections, particularly when such aviaries are damaged by storms. Many birds will have escaped during the great storm of October 1987. However, many aviary birds will have escaped in the same way, without surviving so well in the wild. 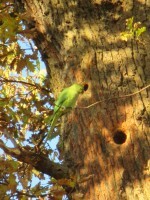 What then has made the Ring-necked Parakeet so successful? The native habitat of the Indian sub-species in the foothills of the Himalayas makes them readily adapted to the cold weather of British winters. They breed early in the year, starting to nest in January in holes in tree trunks, long before birds such as starlings, owls or woodpeckers, that use similar sites, are ready to breed. They lay 2-4 eggs per clutch, with incubation for three weeks, and a high proportion of youngsters fledging in just seven weeks. Adults will go on to raise a second or even third brood in one year, while youngsters are ready to breed themselves at the age of three years. They are pugnacious, bold, and willing to eat most grains, seeds, buds, leaves, berries and nuts. Thus they have a wide choice of food sources, and take advantage of the numerous bird tables and feeders put out in suburban and urban gardens. They will compete with and scare away the more familiar but timid native garden birds at such sites. So are they escaped domesticated species – therefore ‘feral’ – or are they established alien species – therefore ‘naturalised’? I think either description is acceptable and interchangeable. 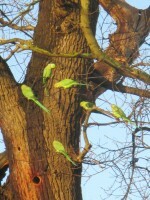 In Britain, free-living Parakeets were first reported in Norfolk in 1835, undoubtedly escapees. However, it was not until 1969 that the first wild breeding was noticed, on the south-east London/Kent borders. This area remains a major stronghold, and Christmas for my wife and I for the last several years has included a visit to an aging aunt in Bexleyheath. This trip always features a brisk walk with our dogs in nearby Danson Park in the breaking dawn. 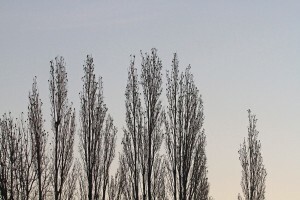 This park is a favourite roosting place of several thousand free-living Ring-necked Parakeets (Psittacula krameri), and it is an awesome experience to first hear, and then see silhouetted against the lightening sky, so many of these long-tailed small parrots in the tall poplar trees fringing the lake. Christmas morning last year was crisp and cold, with a thick frost on the grass and a mist rising off the water as the pale sun rose. The birds became more active, and eventually groups of several dozen broke away from the main roosting trees, and circled over our heads giving their distinctive calls, before flying off to find their breakfast. Where I live in South Buckinghamshire flocks of between 6 and 30 fly regularly over our gardens, uttering their distinctive squawks, while they have nested in hollows in trees in local parks. Many residents in the area have them visiting bird feeders in their gardens, but I have not seen them in such numbers anywhere other than Danson Park. A welcome sight as far as I am concerned! 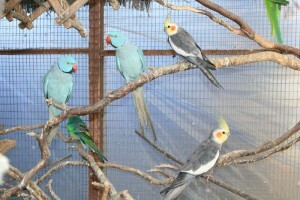 Ring-necked Parakeets bred by aviculturists over generations have produced a number of colour mutations, including white, grey, lutino and blue. However, their free-living cousins are all the original natural green. Any newly escaped colour mutations that join the flock soon interbreed, with their offspring reverting to green. These birds are visually sexually dimorphic – that is to say that males and females are visibly distinct, at least as adults. 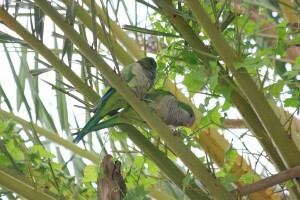 All individuals have bright green plumage, darker on the wings, tail and head than on the back and abdomen. Juvenile birds and females may show a faint grey or light green collar, but adult males have a very distinct black and pink neck ring. 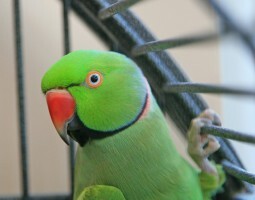 The latter gives rise to the species' alternative name of Rose-ringed Parakeet. Both sexes have the bright red beak, and long narrow tails, accounting for more than half of their total body length of 40 cm. Wingspan is 35-40 cm, with a narrow, falcon-like shape. These birds are fast, strong fliers, and usually very vocal in flight. All-in-all, an interesting species, and a very successful parrot!